We all know that exercise is an essential part of a healthy lifestyle, yet few of us get enough. Perhaps it's time to take a look at how much activity we really need - you may be pleasantly surprised. For many people, their views on sport and exercise were formed during school PE lessons and early involvement in youth sports. Often, what they're left with is the impression that only strenuous sport and exercise is beneficial for health. In fact, there's a well established and growing body of knowledge that shows mild to moderate physical activity is the best way to health. So instead of asking how much exercise is good for you, perhaps you should be asking how little you can get away with. In order to find out how much exercise is enough, you need to be clear about what you want to achieve. Do you want to be fit or healthy? It's easy to confuse the terms as they're often used interchangeably to mean the same thing. But in fact they are different in both physiological and psychological terms. Fitness has been defined in relation to a concept called physical work capacity, or how much work the body can do. A person's fitness can be determined in a laboratory by looking at how much energy they can produce on a cycle ergometer when cycling at a specific heart rate, or on an athletic track by looking at how far they can run in a set time. Fitness can also be understood in relation to a number of components including endurance, flexibility, strength and power. You need to be fit to play many sports, including football, hockey and tennis. Health, on the other hand, is a broader concept that includes being free from and resilient to disease, mental and spiritual wellbeing, and the quality of our social relationships. Normally, being fit and being healthy go hand in hand, but this isn't always the case. For example, you can be very fit, through playing football for example, but suffer a major health problem such as alcoholism. Understanding the difference between fitness and health is important because the level of exercise you need to be healthy is less than that needed to get and keep you fit. Many people want or need to be fit because of the job they do (eg, police officers), the sport they play (eg, basketball) or the body shape they want to achieve (eg, through resistance training). If you want to be fit, you normally need to follow a structured training programme. Such programmes often take place in specialised facilities such as leisure centres and may be supervised by an exercise leader. 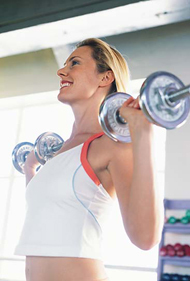 Examples of fitness training include circuits, running and weight training. One of the key variables in achieving a high level of fitness is the intensity of the exercise programme. If you want to be very fit, you may need to exercise at a moderate or high intensity. In achieving fitness goals, most people also become healthier. However, if you don't want to be fit but just healthy, you don't have to exercise as hard. If you want to reduce your risk of suffering from coronary heart disease, obesity or mental health problems, research indicates you should be physically active. To achieve these health benefits doesn't require the same intensity of training as becoming fit. You can simply build physical activity into your daily routine, either as a form of 'active commuting' (walking or cycling, perhaps) or in the comfort of a health club. The main message is that it doesn't have to be hell to be healthy. Some people are put off becoming more active because they think they have to work out at a high intensity, compete with others or wear a designer tracksuit. None of these things are necessary. Use the stairs instead of the escalator or lift at work. Park your car in the parking bay furthest from the supermarket. Don't use the remote control to change TV channels. First published in May 2001.